At the time he wrote that, there had been 5 amendments voted on by the commission. I am curious as to which votes he was referring to. I appreciate his frankness, however I would have rather he had told the commission that he felt there needed to be more discussion at the time of the voting when he felt that uncertainty and trepidation. 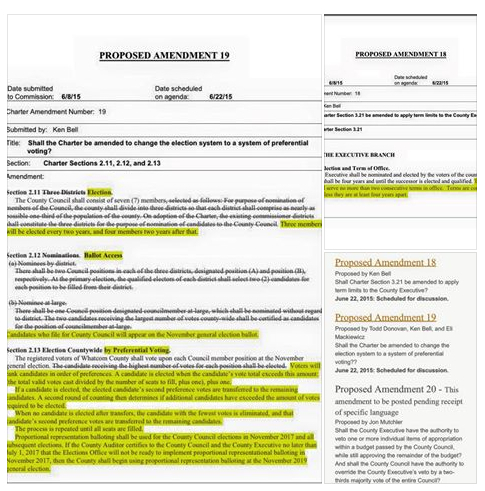 There are now 3 more amendments proposed by the Charter Review Commissioners, bringing the total to 20. I don’t think it is reasonable for the commission to put forth this many amendments. As of today, there are 8 amendments approved by the commission to be forwarded onto the November ballot, but still at least these 3 newly proposed ones will need to be voted on. The average voter is going to be overwhelmed. I know I am already. “Three members will be elected every two years, and four members two years after that.” What exactly does that sentence mean? I’m not sure. I think that the Charter commission should only be allowed to propose around 10 amendments so they would then need to really be careful in considering what particular ones they really want to propose. And those amendments should be proposed during the first few months they meet. After proposing their amendments, the commissioners then would not be allowed to take votes on those until late May to early June. That would give plenty of time for the public to learn about the amendments and weigh in to the commission on those, and for the commission to thoroughly discuss those. As it’s going now, I feel like a plate twirler where I’m just trying to keep plates (amendments) spinning as I’m trying to just keep up with all of those. Subject: Re: Meeting dates, etc. For some time now I have been struggling with our process and I would like to address this issue as early in our meeting as possible on Monday evening. There have been times when we have taken a vote on an issue and in my mind there are still parts of the proposals that are not understood or have not been fully vetted. The format that is being used, one side speaks for and one against is fantastic for expediting the process but horrible for discussing the nuance and exploring the full ramifications of our actions. Can I propose that we not move a motion to vote until we have had a discussion, not one for and one against, but a real discussion on these items before us. Yes this will take more time, but it is what we are here to do. My proposal would be to allow some free flowing discussion prior to a motion being made so we could refine that motion or understand its intent prior to initiating the one side vs the other format? I have cast a couple of votes with trepidation and uncertainty and am not comfortable doing that any longer. Please open the meeting with whatever you need to open it with and then can we have this discussion? This entry was posted in Commentary, Facebook Post and tagged Ken Bell, proposed charter amendments, Whatcom County Charter Review Commission. Bookmark the permalink.